We are very fortunate to be visiting Bluestone Wales this week. For a few months now I've been collecting some bits and pieces of food and supplies to take to Bluestone with us, most of which was either free, bogof or on offer. I've not written a proper meal plan because I want to keep things flexible. There's not enough for 10 main meals because we do intend to eat out, nothing is perishable so I suspect quite a lot of this will be coming back with us ;) at least having some food with us gives us options! And if the rain sets in and we don't want to go out, we're covered! We don't usually use jar sauces much at home, but lately there have been some great offers on branded ones through shopitize or checkoutsmart, the chicken tonight was on offer at £1 and had a further 60p off so at 40p that was a bargain, the Lloyd grossman curry sauce had 50p off when it was also on offer at £1 and the pasta sauce was £1 with £1 off, I didn't really want to be messing about with taking lots of ingredients so it made lots of sense to take these with us. 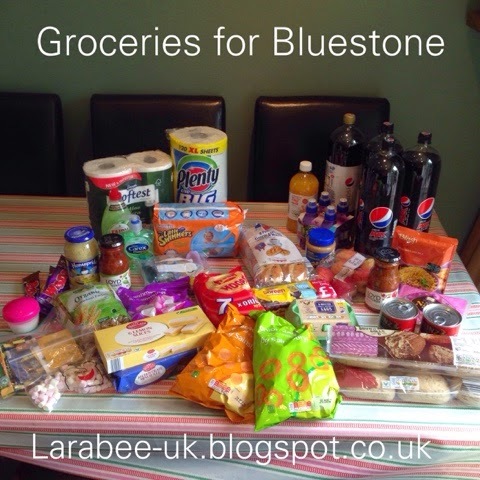 We first visited Bluestone quite a few years ago with the teens and then we went to a local supermarket and stocked up. 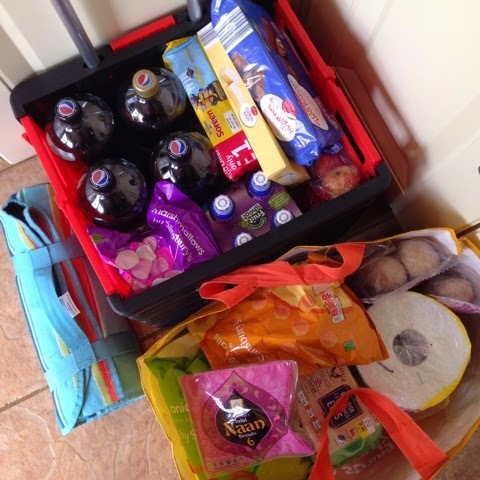 When we've been to self catering complexes before we've actually ordered our shopping from Tesco delivery and had it delivered, which worked out very well, but because of the no cars policy at bluestone, I'm not sure if that would work and so we're packed up with some basics. Beer, wine, milk, meat and butter will be brought nearer Wales. We're expecting at least a couple of stops for T and that will be one of them. All forms of egg, bacon and bread! There's some marshmallows for toasting. I've been collecting tea bags and coffee sachets from meetings at work so will take a pack of them so we don't have to take jars and packets, and I've popped in some hot chocolate for the hubs and T along with some mini-marshmallows. And a million salt sachets for me! I've included some dishwasher tabs, antibacterial spray, kitchen roll washing up liquid and loo rolls to keep us going so we don't have to get them when we are there. I doubt we'll take all 4 loo rolls, as I know that they do supply some. I've also got T's swim pull-ups, I think we run the risk of him growing a tantrum over that, but Bluestones rules are that under 4's need them in the pool. We'll see what happens there. 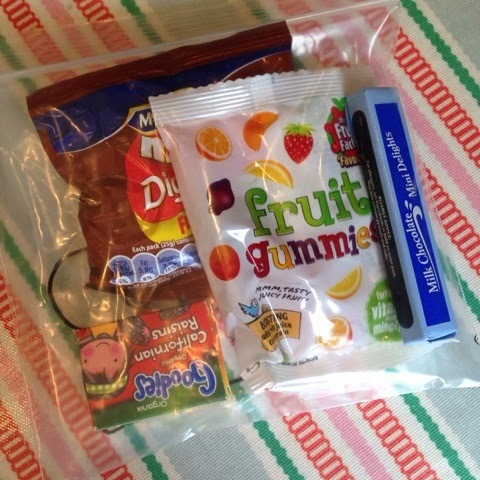 I've made up 5 snack packs for T which can be put in his bag every day, I picked up the wrong fruit gummies as these ones are not 1 of your 5-a-day but as we are on holiday I'm not worrying too much. T also has apples and peanut butter, his absolute favourite snack at the moment, I've left the sprinkles at home, hoping he won't notice! If our trip to Eastbourne was anything to go on, most of these will be left, but it's great to have things to save buying them whilst we are out and about. I've also got some fruit shoot as a special treat. Look out for more of our holiday planning posts this week!